Yield Lab 10 x 20.75 inch propagation trays are lightweight, easy to use, and designed for clones, cuttings, and seedlings. Allow your plants to achieve a strong root structure within these handy reusable containers, which are durable enough to serve many years of your horticulture needs. START OFF RIGHT: Any gardening or growing project starts with the perfect germination tray, helping your plants establish a root system while reaping the benefits of a containerized environment. HEAVY DUTY: Sturdy, durable plastic construction will last through many uses. Our reusable trays are an eco-friendly investment to cut down your costs and reduce waste. SEED FLAT TRAY: Ideal for seed and cutting propagation, these thin wall cloning trays strike a perfect balance between lightweight ease of use and long-wearing durability. 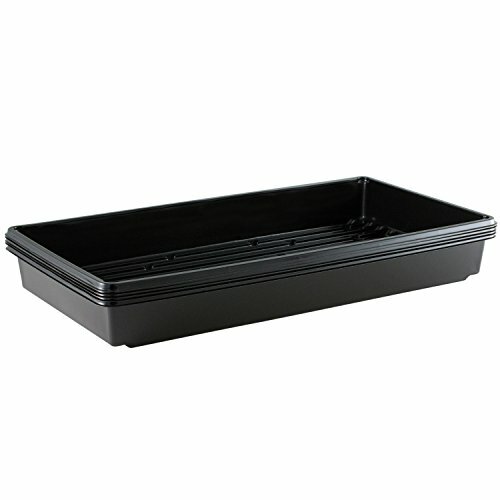 MULTIPURPOSE FUNCTIONALITY: Professional grade tray measures 10" x 20.75" and accommodates 20 clones or seedlings. Compatible with hydroponic grow mats and micro-mats, and doubles as a drip tray- no drain holes. COMPLETE YOUR SET: Designed to accommodate our 8 inch dome for optimal growing conditions. Set yourself up for success by choosing the highest quality materials!